PineyPaddlers are people that enjoy paddling in the New Jersey Pines Barrens and also support each other. We are not a club or formal organization. ALL PineyPaddlers are current members of the Sierra Club ! PineyPaddlers work on water trail maintenance and cleanups and help new paddlers get started the right way promoting sound safety procedures. Who are the PineyPaddlers? Are the PineyPadders a Club? Isn't canoeing or kayaking dangerous? Must I be a good swimmer? Why must I wear my PFD all the time on the water? Must I own my own boat and equipment? How expensive is it to get started? Where do I go to paddle locally? Which is better a canoe or a kayak? Why paddle with a group? Should the Club(s) I join have liability insurance that covers me? Boat-Eater - A "monster hole" in a rapid, big enough to swallow a boat. Also known as a bus-stopper. Boil - Swirly or unpredictable currents pushing (boiling) to the surface. Usually caused by rocks pushing the water to the surface. Bony - Run or rapid requiring lots of maneuvering because of the abundance of obstacles, mostly rocks. C.F.S. - Cubic Feet per Second. Measurement of velocity of water flow at a given point in a river. Will vary according to water level and gradient of riverbed. Carnage - General term for a mishap, as in a boat flipping or someone falling out. Chicken Line - Straps on the sides of a raft for clients to hold on to if they get scared. Use caution as it can entrap arms and legs in a flip. Class I-VI - International scale of river difficulty classification system for negotiating the difficulty of fast-moving water. Class I is the easiest and Class VI the most difficult. Confluence - The junction of two rivers or forks of a river. Curler - A large wave, usually at the bottom of a drop, with a crest that spills upon its upstream slope; may be a surfing wave. Drop - A short, well-defined, rapid or section of a rapid. Named for the abrupt drop in elevation between the top and bottom of the rapid. Eddy - Area of usually calm water behind or downstream of an obstruction in the main current, where water flows counter to that of the main current. Eddy Out - Term used to describe leaving the main current and entering an eddy. Eddy Line - A current differential between the upstream current of the eddy and the downstream current of the main flow of the river. Ferry - A maneuver used to cross a current with little or no down stream travel. Utilizes the current's force to move the boat sideways. Gauge Height - For measuring water levels at one or more locations. Reference point used with CFS (or in lieu of). Gradient - Refers to the steepness of a riverbed over a specified distance, usually per mile. Along with CFS and water level information, this helps paddlers draw a conclusion of a river's difficulty. See CFS and Class I-VI. Hair - Dangerous and difficult water. Haystacks - Big standing waves in a wave "train" following a drop. Headwall - Steep cliff where the main channel of the river drives against it at a 90-degree angle. Highside - When you broach on a rock with a raft everyone moves to the highside to push it back down so it won't wrap around the rock. Hole - A hole is created when the river current drops over a rock or ledge and circulates instead of continues its downstream flow. A significant feature because it either offers play opportunities or danger of trapping, depending on the power of the hole. Horizon Line - Usually indicative of a falls or steep drop. There is a line, but the route, if there is one, is not apparent. Time to exit and scout. Hydraulic - Water formation following a sudden drop in the riverbed or drop over an obstruction that creates a powerful circulating force at the base of a drop. The circulating pressure of a powerful hydraulic can hold boats and paddlers for indeterminate lengths of time. Hypothermia - The cold water hazard for paddlers. Prolonged exposure can lead to incapacitation and eventually death as body core temperature drops below 80 degrees. Lilly-Dipper - A weak paddler. Maytag - Stuck in a hole and thrashed about as if in a washing machine. Usually not fun! New Yorker - A client who whines and complains. Peel Out - Term used to describe leaving an eddy and entering the main current; bow catches the main current and quickly swings the boat downstream. A downstream lean is needed to counteract the current. PFD - Personal Floating Device. The proper name for a Life Jacket per Coast Guard definition. It is required by law for every passenger of all water craft and your most important life-saving tool. Pillow - Water that builds up around a rock in the main current. Pillows are stuffed with rock. Pin - Being stuck between the current and the river-bed or an obstruction such as a rock or log and unable to dislodge. Not fun; possibly deadly! Put-In - Starting place of a river trip, where you put your boat on the river to begin a run or trip. Ramp - Point in a rapid where water constricts/pools before dropping downstream through a channel. River Left - The left-hand side of the river when looking downstream. When downstream looking upstream it is on your right. Roostertail - Spray of water that explodes off a submerged rock or obstacle. Shuttle - The most dangerous part of the trip. Driving between the put-in and take-out. One-vehicle shuttles require logistical foresight using options such as biking, walking, hitchhiking, etc. to return to the put-in. Standing Waves - Big waves that often indicate the main channel. Strainer - Current clogged with tree branches or debris that allows the water to flow through but could pin you or your boat. Very Dangerous! Take-Out - Ending point of a paddling trip, where the boats are finally taken from the water. Technical - Describes the character of a rapid that requires skillful maneuvering because of frequent obstructions. Also describes specific, difficult-to-master paddling techniques. Throw Bag - Rescue device incorporating a 60 ft. floating rope coiled inside a nylon bag, to be thrown while holding one rope end. Tongue - A smooth downstream V indicating the route through a rapid. Undercut - An overhanging rock or ledge with water flowing underneath it. A serious hazard! Waterfall - Major drop in a riverbed, usually over six feet in height. Wave Train - A series of standing waves or runout of a rapid. Also called "haystacks." Most of the terms used in describing canoes, kayaks and rafts are the same as those used in describing other types of watercraft. However, there are some unique terms paddlers need to know. C-1: Decked canoe, a cross between the C-boat and a kayak. Like the kayak, it's decked (and in fact, it looks a lot like one), but like the C-boat the paddler kneels on a saddle and uses a single-bladed paddle. C-2: A two-person C-1, often seen at whitewater slalom races. Requires a great deal of coordination between the paddlers to keep upright and moving somewhere useful. C-boat: Whitewater open canoe, a version of the canoe that's made to handle rough water. Usually includes lots of floatation to keep it from swamping; paddler usually kneels on a saddle in the middle of the boat. Also known as OC-1, or OC-2 in the two-person edition. CFS: Cubic feet per second, a measure of river flow. Continuous: A characteristic of a river. Continuous is usually used as "continuous rapids", meaning that there is little or no flatwater between rapids. Opposite of pool-and-drop. Some pool-and-drop rivers become continuous at high flow. See Pool and Drop. Cross-stroke: What C-boaters do when they need to take a paddle stroke on the other side of their boat. Really good C-boaters develop equal power and finesse on both sides. Eddy: The quiet area behind a rock, pillar, bend in the river, etc. A good place to rest. The line where the whitewater meets the quiet eddy water is called the eddyline. Eddylines sometimes cause sudden flips, especially if there is a significant velocity differential between the current going downstream (main flow) and the current going upstream (eddy flow). An "eddy turn" ("breakout" in the UK) consists of leaving the main flow and getting into the eddy. Eskimo Roll: Basic self-rescue technique for kayakers and C-boaters. The paddle and body are used to turn the boat rightside-up after a capsize. Some even do it without a paddle ("hands roll"). Flatwater: Sections of relatively slow-moving water in between rapids. Allows paddlers time to share their impressions of the last Huge Gnarly Boatmunching Rapids before the next one. Hairy/Hairboating: Usually means boating over your head, or boating extremely dangerous stuff. Some people consider the term "hairboater" to be an honorific. Running 300 FPM creeks or 50,000 CFS floodstage rivers are exercises in hairboating. Haystack: Big standing waves which are breaking on their upstream face. Many rapids will have a series of haystacks downstream of the main hole; riding these is much like bouncing along on a rollercoaster, and can be a lot of fun. Haystacks are a pretty benign form of whitewater, and allow paddlers to show off by "catching air". Highside: This is what you do in a raft when one side goes way up in the air and the raft threatens to flip. Leaping to that side and pushing it down can prevent flips and/or wraps. Hole: The whitest whitewater. This is the area downstream from a drop or rock where there is a boiling action of the water, with a lot of water being reccirculated. This is also known as a "stopper", which is what they do to boats. Some people have named certain nasty holes: Maytag is one memorable one, and that's what it feels like to be in one, upside down. Stay rightside up, however, and they're fun to play in/on. Learning to read the water in and around holes in order to figure out what it will do to you if you land in it is an excellent skill to develop; learning how to get out of grabby holes is another good idea. See Hydraulic. Hull: The bottom of canoes and kayaks can range from flat-bottomed to perfectly rounded. While rounded hulls have the speed advantage, flat-bottomed craft are more suited for whitewater due to their stability. The best bottom for most craft is some compromise of the two, usually a shallow-V type. Hydraulic (AKA reversals): This is a hole formed by current dropping over a vertical or near-vertical obstruction (or a drop in the riverbed). If the obstruction is perpendicular to the current flow, uniform, symmetrical, or some combination of all three, the hydraulic can become extremely powerful. The forces generated as the falling flow pulls surface water upstream can be powerful enough to flip a boat and hold it indefinitely. Swimmers caught in such places are said to be "maytagged", for obvious reasons, and it's not pleasant. Most hydraulics will let go of boats, boaters, and other gear after one trip around or so, but other "keeper" hydraulics will recirculate their contents indefinitely. There are some hydraulics, notably those formed by low-head dams, which are known as "terminal hydraulics", again, for obvious reasons, and are to be avoided at all costs. See Hole. 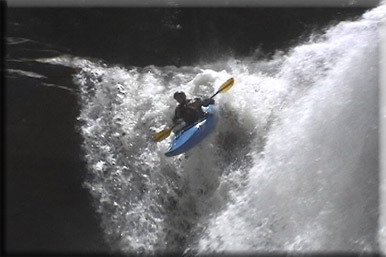 K-1: One person kayak; the paddler is seated and uses a two-bladed paddle. Variants include the squirt boat, bat boat, creek boat, slalom boat, downriver boat and sea kayak. K-2: Two-person kayak, not seen much here in the US, but apparently quite popular in Europe. Lambertville: When used anywhere near Pennsylvania, usually refers to the section of the Delaware River just below the wing dam between Lambertville (NJ) and New Hope (PA). This is the whitewater equivalent of a jungle gym, and is a great place to train at normal flows. At high water, the wing dam becomes dangerous to approach due to the reversal formed behind it, the waves in the center get very large, and any swim could be long due to the length of the rapid and the width of the river. On-side/Off-side: (1) For a C-boater, refers to the side on which they paddle/don't paddle. A right-handed C-boater's right side is their on-side, their left side is their off-side. (2) Most people learn to roll first on one side, then the other, and few develop equal facility on both sides. The stronger side is generally called the on-side. Peelout: Crossing the eddyline back into the current, usually facing upstream about 45 degrees, with the intention of turning downstream. Pillow: When water strikes the upstream side of a rock, it sometimes tends to "pile up" in a standing wave. These "pillows" tend to bounce a boat away from the rock and can be used as an aid to maneuvering... provided you don't wash into or over the rock. The absence of a pillow on the upstream side of a rock can mean that the rock is undercut, BUT the presence of a pillow DOES NOT necessarily mean that it isn't. Pool and Drop: Many rivers are characterized by fairly short rapids interspersed with flat stretches which make rescue a bit simpler and allow paddlers to compose themselves before the bottom drops out again. Such streams are known as pool and drop rivers, as opposed to continuous. See Continuous. Pourover: Pourovers are rocks with flat tops that are just under the surface of the water. Running them can be tricky: if there's not enough water flowing over the rock, the boat (especially a raft) may become lodged on the rock. Occasionally, pourovers also come complete with sharp surfaces capable of putting new holes in boats. Generally to be avoided unless you're sure of what you're doing. Rocker: Another measure of the shape of the hull, this time below the water line. Rocker refers to how curved the bow is along the keel line. As expected, no rocker produces a fast canoe that loves to go straight, a nice feature when touring on large lakes. A heavily rockered boat will turn on a dime, but will not track well. Most recreational canoes will have a slight amount of rocker and a straight keel line. Sluice: Water going through a very narrow passage between two rocks at high speed. Usually terminates in a strainer or something equally nasty, and should be avoided. Staircase: When used anywhere near Pennsylvania, usually refers to the section of the Shenandoah River at Harper's Ferry. The Staircase itself is about a mile of the river, just about its confluence with the Potomac, which contains dozens of diagonal ledges ranging from a few inches to several feet high. It's class II-III at most levels, but becomes significantly harder at high flows due to the continuous nature of the rapids. Standing Wave: This is where fast water meets slow water, causing a wave to build up. They're fun, but can swamp open canoes. Strainer: This is what happens when trees, trash, and other assorted items become lodged in rocks in the path of the current. Boats and boaters who float into strainers tend to stay there, so avoid these, period. If you do by some remote chance find yourself swimming into one, try to climb up onto whatever's in there -- you might be able to get over it and float off the other side, or possibly climb out of the water. Many undercut rocks have strainers under them, creating an extreme hazard. Surf: Surfing the standing waves in a river is much like surfing the moving waves in an ocean. Surfing is done by getting onto the upstream face of a wave, and then letting gravity (pulling the boat down and upstream) balance the force of the wave (pulling the boat up and downstream). All the boater needs to do is to keep the boat pointed parallel to the current, and the river does the rest. Surfing with the bow downstream is known as backsurfing. It's also possible to sidesurf hydraulics; one leans downstream on a low brace and balances the recirculating force of the hole against the friction of the current on the boat's hull. This takes quite a bit of balance, and one's first few attempts usually terminate in a *very* fast upstream flip ("window-shading"). Tumblehome: Refers to the shape of the sides of a craft, especially open canoes. If the sides flare, the boat will be better at keeping water out, but harder to paddle, as the paddler has to reach out farther to place the paddle in the water. Again, a compromise is best: combinations of tumblehome and flare will change as the use of the canoe changes. Racing canoes which rarely see a wave will have extreme tumblehome, but larger touring canoes will have more flare to keep the waves out. Undercut: Over time, rivers can erode out the bases of rocks which are in the path of the main current, forming undercut rocks. Undercuts represent an extreme hazard to boaters, since rescue is nearly impossible once someone becomes trapped under such a rock by the force of the current. Some, but NOT all, undercut rocks are characterized by the absence of a pillow on their upstream face: the current goes under the rock rather than bouncing off. Some, but NOT all, undercut rocks may also be recognized by the presence of a current coming out from the under the rock on the downstream side. Avoid undercuts, period. Vee: These come in two flavors, upstream and downstream. 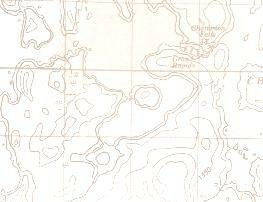 A downstream vee (i.e. the point is downstream) indicates the main flow of the current is passing between two obstructions. Generally speaking, the middle of the vee will have smooth, flat water moving a high speed; this is sometimes called the "tongue". Upstream vees indicate the presence of an obstruction at the point of the vee; they usually also indicate the presence of an eddy just downstream from the obstruction. Wrap/Pin: What a boat does when it gets plastered onto some obstruction by the current. Rafts tend to fold around rocks, dumping the occupants into the river. If you're in a raft that's in the process of doing this, try not to (1) get caught between the raft and the rock or (2) get your foot stuck between the tubes and the floor as the raft pins. Luckily, most of the time, raft occupants will fall out to either side of the pinning obstruction and wash away. Hardboaters are in considerably more trouble: the decks of their boats may collapse, pinning their lower bodies inside. Wrapping and pinning situations are extremely dangerous, and call for quick, knowledgeable rescue. PineyPaddlers are canoers and kayakers who enjoy paddling in the New Jersey Pines Barrens and also support each other. We are not a club or formal organization. Most PineyPaddlers are members of one or more canoe and kayaking clubs. Not as dangerous as the car trip to the water. Not as dangerous as Personal Water Craft (PWC) such as jet skis. Training, practice and at least 2 companion boats greatly enhance safety. No. Just paddle ashore in your PFD (Personal Flotation Device). You should practice with it on warm days and learn to be comfortable in the water while wearing it. Great confidence builder. It keeps you afloat to swim (dog paddle?) ashore in calm water. In faster water you simply float in it till you reach a calmer place. It protects your upper body from bruising on rocks or stabs from sharp prongs of trees. It keeps you afloat if you are unable to help yourself and provides a visible "grab-onto" for rescuers. Wear a bright one. Not necessarily. Boats may be rented from local liveries and often boats can be borrowed from other paddlers. Most people soon find that they want their own boat and equipment. Your boat and gear become familiar and trusted companions and allow you to expand your skills. Like buying any equipment, new or used, prices vary widely. A solo boat, Paddles, PFD and transport gear should come in around a $1000 new, lots less used. Don't buy a used PFD unless you know who owned it. 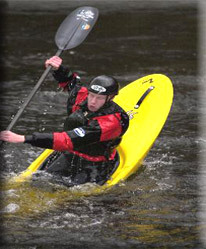 There are several paddling organizations in New Jersey which offer formal training in basics and advanced techniques. The American Red Cross also has a canoe/kayak course. Informal education happens on every trip. New Jersey is often thought of as completely urban, however, there are about 78 streams available, not counting the Delaware River and our neighboring Hudson River and the historic Delaware and Raritan Canal. Not all are run-able year round but there are enough to satisfy a longing for adventure in fast water or serenity of the Pinelands mystic rivers. Neither is better, only different. Both are capable and fun. One must know how they like to paddle. What do you need on a day trip? Do you want to camp? Are you comfortable sitting in a small cockpit (kayak) or do you want more "moving around" room (canoe). No alcohol on the water. Boats and booze are a deadly combination. Save your "cold ones" and toasts for after the trip. Why paddle with a club? SAFETY! --Transportation from take-out back to your car. Expanding skills and meeting people of all ages, skills and walks of life who share the love of a quiet boat on the water. Club liability insurance is a must! YES! YES! YES! --You should familiarize yourself with the Club's insurance policy. Make sure that the club insurance protects YOU (not just the clubs officers and bank account) for liability and property damage acting as an activity leader and/or activity participant. If you require a higher level of insurance then the Club provides, then you should look into a rider addition added to you own insurance policy.